Masaki Matsushima has launched two new fragrances, Shiro and Art Homme. Shiro (shown above) ~ "Translated from Japanese, the word Shiro means pure and white. Based on the obsession with purity and cleanliness this perfume is the conceptual translation of a certain social aspect of Japanese society. [...] Shiro is a purifying and relaxing "fresh laundry - fragrance". This fresh floral and pure fragrance begins with a delicate bouquet of cotton flowers, roses and cyclamen before the "fresh linen" heart merges into a soft, white, powdery base of white musk to create a unique olfactory experiment." Additional notes include spruce balsam and iris. 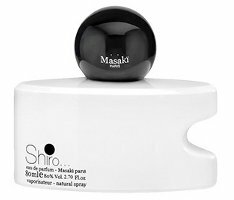 Shiro is available in 80 ml Eau de Parfum. Art Homme (not shown) ~ "After the success of the Art line for women, Masaki Matsushima introduces Art for men, based on two principles: style and elegance. [...] Art Homme is a rare and exclusive men's fragrance, an aesthetic perfume, with musky, floral and woody notes composed around white musk, orange blossom spices and woods." Additional notes include cardamon, black pepper, tangerine, iris, patchouli and fir balsam. In 80 ml Eau de Toilette. I look at that bottle and I see an abstracted chunk of Swiss cheese with an abstracted mouse sitting on top (really), and I like it very much. But then, I’ve always liked the Mat bottles, even when I’m not that interested in the scents inside them, which is usually. I like them in theory. I don’t like to hold them…they seem awkward. Have to agree with pyramus above. I adore Masaki’s bottles, but why o why are they not sold in the UK? They’re hard to find in the US too. OH MY! Shiro Sounds Like a DREAM! Cyclamen and Roses and Cotton Flowers!?!? EGADS,YES!!! The Art Homme Sounds Equally desirable! Please Sephora… Carry theses!